LinkedIn users hunting for a job may want to spruce up their profiles. 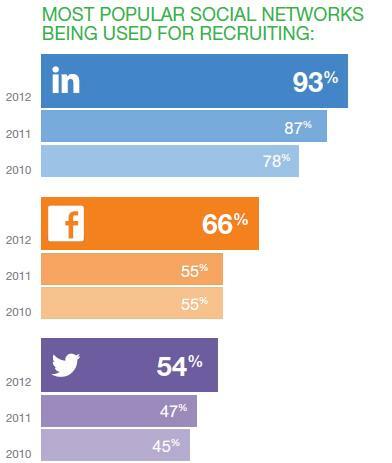 In second place, Facebook is used by 66 percent of the recruiters polled, up from 55 percent last year. And Twitter is on the watch list among 54 percent of those surveyed, up from 47 percent last year. This increased dependency on social networks means job seekers need to be even more careful what they say and how they say it. More than half of the recruiters polled said they'd react negatively to a spelling or grammatical error in someone's profile, according to the survey. And to no surprise, posts that use profanity, are of a sexual nature, or mention illegal drugs are looked down upon by an even greater percentage. "The rise in social recruiting has allowed both candidates and employers an easier way to find the best match," Jobvite CEO Dan Finnigan said in a statement. "We continue to see social recruiting gain popularity because it is more efficient than the days of sifting through a haystack of resumes. It also increases quality referral hires, which our own data on Jobvite proves are hired faster and last longer." Conducted last month, Jobvite's "Social Recruiting Survey 2012" polled more than 1,000 HR professionals and and recruiters on their use of social networks.